Gaza is all in the news since protesters were fired upon by Israeli Defense Forces (IDF) from inside perimeter fence dividing peoples and ideas. As complex as the situation in Palestine is though, there are only four concrete sides to the crisis. Here are those four sides framed and simplified in the hopes that sanity and humaneness can prevail henceforth. Western media takes the side of Israel. This is plain to see whether you watch TV, or if you read newspapers on or offline. It is a fact. No matter how conciliatory or understanding mainstream outlets and writers may seem, the Israeli narrative ends up dominating. Hamas becomes the villain no matter how many men. Women and children vaporize in front of or beneath IDF guns, cannons, missiles, and bombs. In the end, it all looks like honest reporting. The Washington Post piece today by former U.S. Ambassador to Israel, Daniel B. Shapiro is a Xerox copy of a now familiar style that boils down to “those poor Palestinians, victims of the dastardly Hamas henchmen.” The story always goes like this, sweet and cuddly and defenseless Israel forced to shoot. In short, our media depends on stupid and gullible readership and viewers. It does not matter “why” our media sides with Israel, they simply do. This brings us to the next side of the situation. The American people as a whole could care less about suffering Palestinians or anybody else for that matter. Sure, there are a scattered few raising their voices, but most people just accept the narrative and move on with their lives. You see, connecting the dots in between world crises and average daily lives is just too huge a leap. This is especially true since American media is more or less owned by Israel sympathizers and influentials. In defense of my people, there is really no other narrative to adopt. And there’s certainly no politician to turn to for Americans defending human rights. Furthermore, if we turn to NGOs and other support mechanisms involved in the Israel-Palestine situation, the Israelis eclipse and activism that might defend the people of Gaza. To make matters worse, the Israelis now ban members of more than 20 peaceful activist organizations worldwide from entering their country including the American NGO Jewish Voice for Peace. So, the American people are insulated from any narrative but the Israeli one – and so are the Israelis. This brings us to side three of the justice box Gazan’s are trapped inside. Last week we had a visit from an extraordinary man from Tel Aviv. I’ll not mention his name out of professionalism, and because his identity is fairly irrelevant. I can tell you he is a typical conservative Israeli while being unique in his expertise in Israel’s business, education, and defense sectors. Kind and brilliant at the same time, this gentleman reflects the best Israel has to offer. ,But during out conversations my Israeli friend also demonstrated the hardheadedness of core Israeli dogma. Any argument of this nature always reverts to “We’re defending ourselves, what would you have us do?” And naturally, all conversations in this vein lead to the Holocaust, the Nazis, and natural hatred of Germany. My point here being, Israel’s “Iron Dome” not only prevents missiles from coming in, it prevents alternative views reaching anybody there too. The sad part is, the Israelis are generally wonderful and intelligent people. But this hardheadedness and unshakeable rhetoric is the fact even given clear evidence of wrongdoing like I am about to show you. The last “side” of this whole Israel-Palestinian conflict belongs to innocent Palestinians, not the Hamas radicals Israel says it targets. In my discussion above with the Israeli professional and friend, I brought to his attention the unwarranted shootings use of disproportionate force human rights organizations and some world leaders now demand answers for. And again, the average Israeli withdraws to assume the victim role. But my friends, many of the real victims of the recent sniper shots from across the fence were not even close enough to the border fence to be any possible threat. I had suspected this all along, given my own expertise with long-range rifles, etc. You see, snipers to not cheer 50-yard hits like the IDF soldiers in that now famous video. Snipers are not deployed to set up 200-yard kill zones. Snipers are trained for very long range engagement, and with the notion of “one shot – one kill” beaten into their brains. It takes a special mentality and ability to be a sniper, and Israel has some of the best. 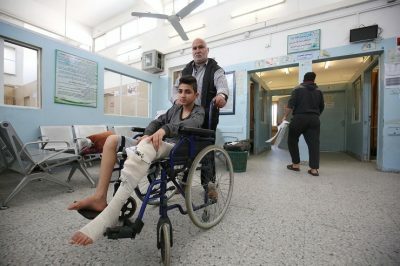 That’s why I asked my friend Bahaa Salman about an image of a young boy named he sent me from Gaza of 16-year-old Mohamed Wahdan, a young boy just treated for a splintered leg as a result of sniper fire. As you can see in the feature image of this report, the boy had a very bad day at the hands of an IDF expert marksman. And I can tell he is expert because Bahaa tells me the boy was hit just East of the Jabalya refugee camp. According to my friend Bahaa (who’s never misled me before), Mohamed was hit at a range of 700 meters from the fence while walking with his dad. I’ll let this soak in. A 700+ meter hit to the fibula of a skinny Palestinian boy is not a defensive action. My guess is the “shot” was some kind of wager in between the members of an Israeli team at a position set up pretty far behind the Israel-Gaza fence. But my points here are all well made now. The only thing that remains is determining solutions based on facts. And it’s damn sure sniping kids one klick off from the demonstrations are not part of the solution. Nor is inaccurate media or political coverage. And Israelis refusing to accept truth and compromise will NEVER moderate this situation. The solution is a compromise that takes everyone into consideration. The solution is justice, and not “might makes right” – which is another typical notion many Israelis share. I know, I talk to them as often as I do to my Palestinian friends. “Follow the blood,” I always say. And to the best of my knowledge, Israel is not doing the bleeding in this conflict. Let’s look for truth, Hamas is Hamas and an entirely different aspect of this crisis.